Cornish Pasty Recipe – a tradition in the northern regions of America. For those of you from the Upper Peninsula of Michigan (the U.P. ), guess what? The restaurant serves Cornish Pasties occasionally! And for those of you not familiar with the U.P., allow me to explain. This particular food item is a deeply embedded tradition in the Upper Peninsula of Michigan, and a few other areas nearby as well. Even though I am a Washington State native, I am very familiar with this meal because my husband's family comes from many generations of "Yoopers." More specifically, much of his family came from an old mining and lumber town called Michigamme. The town, located on one of Michigan's largest lakes (Lake Michigamme), is now becoming a haven for expensive summer homes. The pasty is such an important tradition with people in the U.P. I am told all true Yoopers keep a copy of the pasty recipe in their wallets for emergencies. This is probably a "Yooper Truth," eh? The traditional pasty is a complete meal consisting of meat, potato, onion and often rutabaga all wrapped in a crust and then baked. 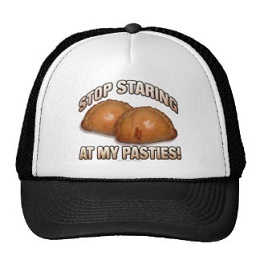 Pasties came to the Upper Peninsula when the tin miners from Cornwall, England, came to this country looking for work. Many settled in the U.P. as mining was a major industry in the area (copper and iron ore). Pasty shops can be found where the people of Cornwall settled. They are, however, most prevalent in the Upper Peninsula of Michigan. 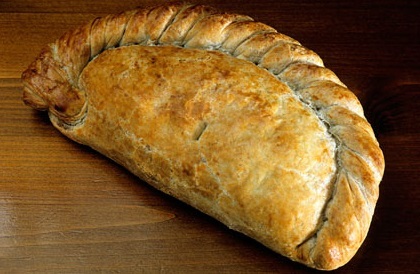 No one can pinpoint exactly when the pasty originated, but it can be traced back to Henry the VIII (1491-1547) of England. There is a letter in existence from a baker to Henry's third wife, Jane Seymour, saying "...hope this pasty reaches you in better condition than the last one..."
And this: "Wife, bid these gentlemen welcome. Come, we have a hot venison pasty to dinner." (Shakespeare's play "The Merry Wives of Windsor"). The pasty became the Cornish miners meal of choice for many reasons. A miner could leave home with a hot pasty in his pocket and reach in once in a while to warm his hands. In Cornwall, arsenic was often found in the tin mines. This is the reason for the thick pastry crimp on the pasty. The miners would hold the pasty by this crust throwing it away after they had eaten the body of the pasty to avoid poisoning. The crust wasn't wasted though; the miners were firm believers in ghosts and left the crust for them. Legend has it that the devil will not step foot in Cornwall, England. The reason is he fears the Cornish housewife! The devil fears that if he goes to Cornwall he might wind up in a pasty. This pasty recipe is from a favorite person in my husband's life. Karen, a beloved cousin, and her husband, Jim, shared their recipe. It is very much the traditional way of making a pasty. The recipe calls for rutabaga but you can omit it if you wish or substitute a turnip. You can also just add more potatoes if you want and some people substitute carrots for the rutabaga because they don't like turnips either. This traditional recipe also calls for some pork, as well as beef. Many people I know use only beef. Perfectly alright, just replace the pork amount with more beef. 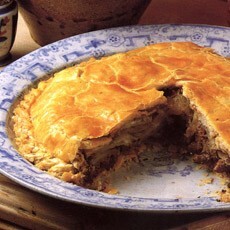 Another notation about pasty recipes: Traditionally, the beef and pork are cubed pieces of meat, not ground beef. 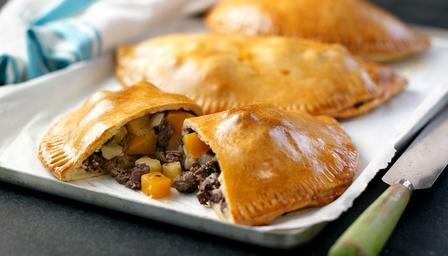 Many pasty makers and pasty shops have converted to ground meat as a matter of convenience. Preparation time: 25-30 minutes. Serves 4. 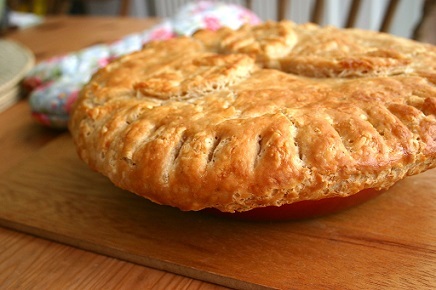 If you are short of time you can buy ready-made pie crusts and form pasty crusts out of them. The pie crusts you should buy are the kind that come two in a box, and are not the frozen kind that come with pans. Pasty-pie Although not traditional, some people use this same basic pasty recipe but combine the ingredients into a pie (see picture) and cut serving sizes from that pie. 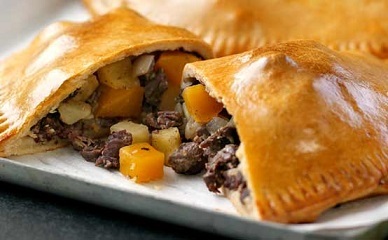 And if you want a pasty recipe that uses ground beef, I recommend you visit ﻿ Upper Peninsula Now. The website is about the U.P. Did you know? People from the Upper Penisula of Michigan are officially called "YOOPERS." Enjoy your pasty recipe and the company of those you share it with! (PS) Just for fun (from my point of view), here is a picture of the restaurant near Michigamme where my mother-in-law was waitressing when she met her future husband (my future father-in-law). 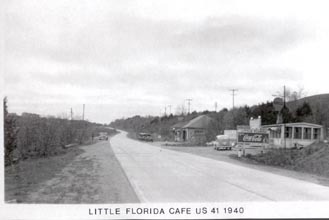 I do not remember why the owners named it "Little Florida." This was one cafe that actually did not serve pasties!